The Congressional Black Caucus Chairperson, Marcia Fudge reacts to the Supreme Court decision on the Voting Rights Act. I share Representative Fudge’s outrage and disgust at this racist decision perpetuated by the so-called high court. When Sarah Palin declared that it was time to “take the country back”, this is exactly what she meant. This decision from the Supreme Court is probably more than these hoods could have ever hoped. I only hope that people born after desegregation in this country see this decision as the wake up call that it is. Do not take for granted that the rights you have today will always be. We must ensure that the rights that we have gained through blood, sweat and tears are not lost, and that we further build upon and solidify those rights. There will always be hateful people who want nothing more than to control and subjugate people of color. Let’s not allow these haters to win. 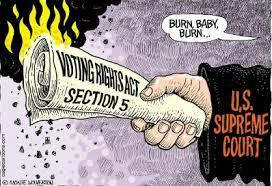 Do what you must to ensure that you have what you need to VOTE these haters out of office so they can never again nominate anything like a John Roberts, Antonin Scalia or Clarence “Thom”as. This entry was posted in CBC and tagged CBC, Congressional Black Caucus, Race, Representative Marcia Fudge, Supreme Court, Voting Rights Act on June 30, 2013 by speakingthosethings.